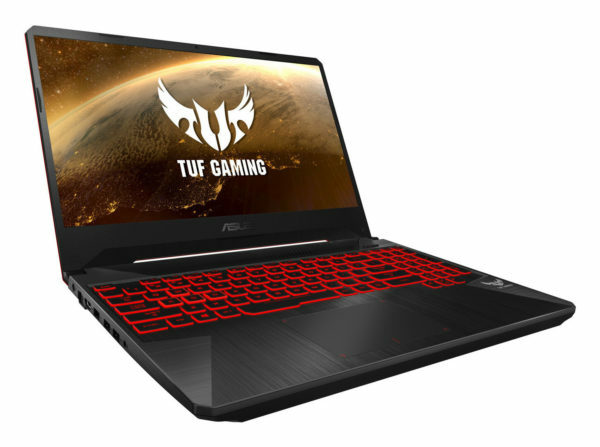 Asus TUF FX505DY, a newcomer in the gamer market that aims at the entry-level with a call price around 800 €. It is the first PC to integrate the latest Zen Ryzen 5 3550H processor that it couples to a graphics card not so young but the duo is doing particularly well. The PC also offers a respectable autonomy. Take the chassis of the FX504, cut corners and get the Asus TUF FX505. The design and materials remain the same. Unfortunately, this also means that all the disadvantages of the FX504 are still valid, including the flexible lid and the cracking hinges. Here, the case composed mainly of plastic returns a rather qualitative image and the hinges seem robust even if the tester wonders about their longevity. 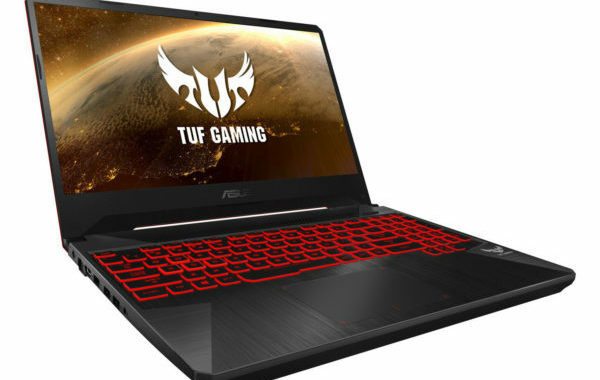 The Asus TUF FX505 joins the Asus FX504 in terms of thickness and length, but the width has been reduced by more than 20 mm due to bevelled edges. It stands out as one of the most compact gaming laptops in 15 inches, without taking into account high-end models like the MSI GS65 or the Razer Blade 15, which cost twice as much. We find the same connectivity and the same positioning as the FX504, with the difference that the HDMI port has been upgraded from version 1.4 to version 2.0. The tester still regrets not seeing a Type-C USB port that should be a standard in 2019 according to him. The SD drive is also excluded. Access to internal components is easier than expected and only requires a Philips screwdriver. The lower panel disengages without much effort, opening on two storage bays, two SODIMM slots and on the battery. Again, the red backlit keyboard and the plastic touchpad are very close to those of the Asus FX504. The sides of the keyboard are narrower this time because of the narrowing of the case but the restitution of the keys remains satisfactory with a relatively quiet hit. For its part, the touchpad is disappointing. Its built-in mouse buttons are spongy and the plastic surface hangs up a bit if you try to move the slider gently. Fingerprints will also accumulate very quickly. Too many “affordable” PCs are equipped with TN panels that offer poor contrast, shallow colors, and narrow viewing angles. Fortunately, the Asus TUF FX505DY is not part of this case and offers a panel IPS Full HD (1920 x 1080 px) without any of these disadvantages. Admittedly, it is still an entry-level model with average colors, response times and brightness (223.5 cd / m²), but everything is better than TN. The contrast ratio is surprisingly good (1000: 1) and the colorimetry quite limited with 60% of the sRGB space supported. The model under test is based on a last generation Ryerson 5 3550H Quad Core and a Radeon RX 560X graphics card, the only configuration on the market today. Here, the duo is supported by 8 GB of RAM and a 256 GB dedicated SSD. The new processor Ryzen 5 Zen perfectly fits the comparison with a Quad Core i5-8300H from Intel with performances very well maintained over time , which has a little bluffé the tester. Thanks to the presence of a fast SSD, the system is reactive and does not accuse any lag or latency. In terms of graphics performance, the Radeon RX 560X Polaris is not new and will rank at the same level as a GeForce GTX 1050 at NVIDIA. Thus, the game in Full HD is possible on demanding titles provided to limit the level of detail. At rest, the cooling system is silent but it does not last long, because even light loads such as navigation or video streaming turn the fans up to 32 dB. For lovers of silence, the tester recommends switching to “energy saving” mode. At stake or demanding operation, the noise is higher than the average with 49 dB recorded. Moreover, the heat is rather well dissipated with surfaces that heat reasonably and components that never suffer (good CPU / GPU operation). The tester did not expect much from the small battery installed onboard this Asus TUF FX505DY. However, she managed to follow nearly 5:30 Internet browsing with active WiFi, which places the PC a little above the average PC gamer.